There are things in life which are pure, which are simple and straightforward, and often it isn’t until we’ve had some time away from them that we truly appreciate how invaluable they are. That’s how I feel looking back at The Friendly Giant, something I love as a young boy. I now have a stepson of my own, and spending time with him has re-invigorated an appreciation for the purest forms of art. Board games that accomplish this task are essential. Alex Racine is a 3D printer, board game designer, inventor, and a big proponent of DIY game making. He launched Games By AR in the summer of 2017 and has been slowly building up his roster of games. I’ve spent some time with him 1-on-1, learning about his passion for making games (1) (2), so follow the numbers I’ve listed to learn more about him! Now, Uprise is the first game he has officially launched, but he has a couple of other games on the way (Anchor What?) too. I wanted to give him an opportunity to describe his game in his own words. 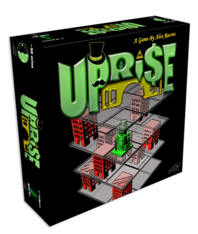 Uprise is a strategic tower building game; grow your secret society by completing your Missions! Disguised with a trendy Top Hat, travel to countries around the world. Disguised with a mischievous Moustache, you’ll be free to place your Bureaus. Successful Secret Societies have Secret Agendas. Yours, of course, is no different. To be fair, Uprise is still in a state of production. You see, dear readers, Games By AR is launching this game on Kickstarter, as many designers do these days, to get the game backed, produce lots of copies and get a foothold in the door. So you can’t buy this game today and bring it home tomorrow – yet. If you back his campaign though, you’ll have fun getting to build your own towers using a mix of strategy and dexterity. 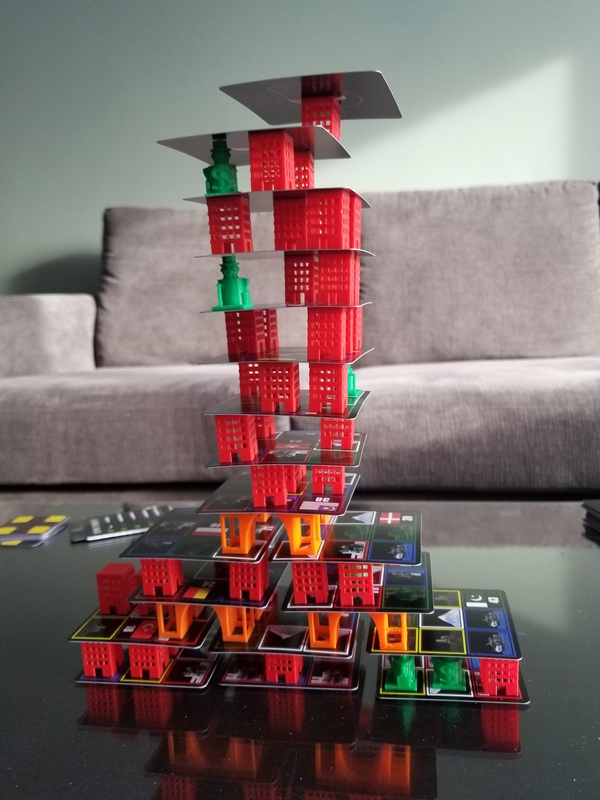 What’s great about Uprise is that it can be played solo, cooperatively, and competitively, with various player counts. As I mentioned above, what I find fascinating about this game is that you can play it with children, and yet, it works just as well with a group of serious gamers in a bout of competition. This is accomplished by either building towers as a team or working on your secret agendas separately with mission goals to have the most bureaus, reach a certain height first and a myriad of other challenging problems. With the introduction of crisis cards, you can tip the balance of power in your favour, and buy decoys to help build your towers without the use of stache cards. Pros: The theme is so well considered, the components are tactile and withstand abuse, and the variety of modes can accommodate different player groups. Cons: While the game is easy to learn, the instructions on how to play the game in it’s different modes are not always apparent without some serious investigation. 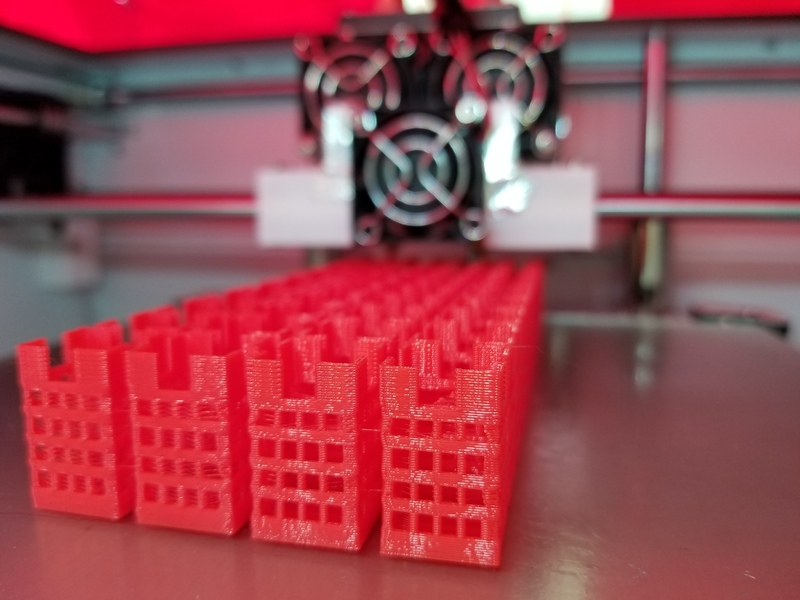 Points of Interest: Alex has two 3D printers at home that he has put to task in helping to cut costs on game production. Games By AR is not only a board game company, Mr. Racine has created several carnival games over the years, and even some variations on popular sports. Now, I haven’t mentioned this yet, but another fun component of the game is the ability to use bridges, and other yet to be released pieces in constructing famous buildings, behemoths of architecture and fantasy structures. Do I think you should pick this game up? Yes absolutely, it does it better then Rhino Hero, Riff Raff, Bausack, Ghost Blitz and a host of other dexterity games, while being a fun strategy game too. And if that still doesn’t make a good case for it, please check out my video review for some more insights. I promise you’ll get a laugh out of my late night antics. I really do hope this was a helpful review. And please let me know if you’ve bought the game and enjoyed it as much as I do, independent game designers like Alex work really hard to bring these ideas to the table, and they appreciate feedback when their work is satisfactory. So please let me know what you thought of my review, like and share the video, and subscribe to the channel if you haven’t already. More theories to come next week! Some people in your life just seem to click. You dig their vibe, and they dig yours. It’s very satisfying when you run into someone who thinks similarly and has a drive to match your own. An achiever, with a command of their emotions (much like Bruce Lee), and with a great level of strategic intent behind every action. That’s how I felt when I met Alex Racine for the first time, over a year ago. At a Halloween party, no less. Alex puts himself into everything he does. His halloween parties feature layers and layers of props, not to mention thematic food and games. He and his girlfriend are excellent hosts, and they have surrounded themselves with a dynamic and fun-loving group of friends. But that’s not all that matters to him. His deep appreciation of building things goes back into his college years. If you read the preview interview, and watched the associated video, you’ll know I’ve already mentioned his love of sport games, his carnival game events, and how he has evolved into constructing tabletop games, but it wasn’t until this past summer that Alex got serious about formally developing a game, playtesting it thoroughly, and reaching out to the internet for crowdfunding. He even cut back his day job, so he could focus most of his time on launching this passion project with proper attention. You could say he’s a 3D printing enthusiast, but I would call him more of an inventor and a game designer. An explorer for a digital age. Last week, as I mentioned, the preview interview was launched to address a question about the difficulty with designing your own board games, and it was assembled by the founder of Games By AR; the one and only, Alex Racine. You see dear readers, Alex believes that you should see a creative project all the way through on your own terms, from start to finish. Which is why I had so much fun constructing the questions for him. He’s a thinker, and a dreamer, but most importantly, he delivers. And he does it all on his own terms. We talked about his launch game Uprise! and a little bit about his follow-up game, Anchor What? But this interview is mostly about the importance of doing it yourself. I hope you enjoy it as much as I did recording with Mr. Racine. I still can’t believe how quickly that one went up. When all was said and done, I had over 2 hours of footage to work with this time dear readers, but I needed to keep this interview at a reasonable length… And it turned out fantastically! So if you want more of the man behind Games By AR, please, please, please check out his Facebook page, Instagram, Twitter and website yourself! He’s building upon better and better ideas every day – don’t believe me? Just ask his Bibo 3D printer. And special thanks to Alex for being awesome, amiable and adaptive. His desire to make games that people care about, have fun playing, and want to share is incredible. The fact he has the talent to back it up, even better. I foresee Uprise! as the start of something beautiful. Thus we land on the final pun. A few months back I wrote a niche post about an idea we have at timotheories. I put it fairly directly at the time, and it still rings true, but I’ll expand on that idea today. The idea was one that might be obvious, but like many obvious ideas, it should be repeated. 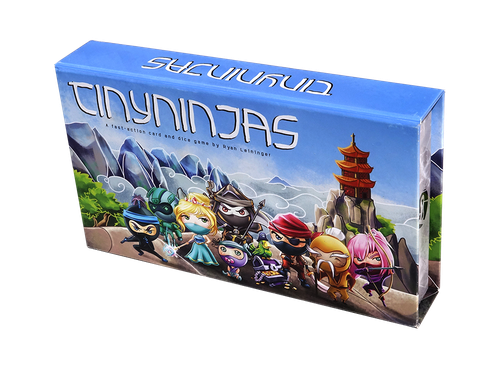 BECAUSE it’s important – Board games have been associated with children, fun, and idle time for a few decades, but the truth is that not only are they a lot of fun, they are now absolutely useful and necessary in our culture. And they will continue to be a key feature of life as we become more reliant on digital tech to work, communicate, and conduct most affairs in our personal lives. The reason for this need is that board games do something that is really is important for human beings, but which cannot be achieved via digital tech. Direct human contact. See a little light bulb just went off, didn’t it? But before we continue, we should clarify that much like realm of advertising, which is a component of marketing, and not a root word, board games are a facet of something larger and should be used in context. As dogs are to mammals, board games are a type of table top gaming. As for the politics surrounding chance for strategy in table top gaming, let’s not get into that today. This is where Real Time Games came into the fold – Real Time Games, as I’ve mentioned before, is about people and sharing the joy of board games with them. My brother Ryan and I set up a weekly gaming group so that we could ensure that we spread the message, so-to-speak, about the hundreds of hobby games now available and which have slowly been cropping up since the turn of the century. Nowadays, there are all kinds of hobby websites, YouTube channels, brick-and-mortar stores, and organizations that help promote this niche industry. But the proletariat are less versed in culture shift that needs to take place. Yes, it’s happening, but ever-so-slowly, which is ironic given the motility we are supposed to have with the current technology at our fingertips. And so we play different games every week, with the intent of sharing the social value of the games that we play. And my original plan was to develop a video series for Real Time Games wherein we discussed the value of said games via a standard table top review. But it occurred to me that that wasn’t a realistic use of Ryan’s time, and he wasn’t comfortable getting in front of the camera to declare expertise. So the idea sat, and ruminated for 6 months or so. But now it looks like I have found a new partner in crime, and so Real Time Games evolves to become more timely delivering content to those who are using technology but looking for analog connection. So please stay tuned as that idea unfolds. Because we’ll be discussing the latest and greatest at Edmonton’s new hot spot, The Gamer’s Lodge. I’m not going to reveal any more, since I’m out of theories for today, but stay tuned as I work with my new partner to set up this regular service and help flesh out our community.